Originally issued by Marco Polo in 1988, this is a damn endearing little CD. The alphorn is that ungainly (some would say "ungodly") instrument used in the Alps (and in other European mountains) to relay messages, before cellular phones became all the rage. It is a rare visitor to the concert hall. Its timbre is horn-like, but it has a restricted range - as few as five notes - and its notes aren't even of equal quality, so composers need to dance around its limitations with deftness. Leopold Mozart, when he wasn't raising his son Wolfgang, wrote several concert works for unusual instruments, including the bagpipes and the hurdy-gurdy. The Sinfonia Pastorella was scored for "corno pastorito," which can be translated as "shepherd's horn." We don't know if he had the alphorn in mind, but it is well suited to the solo part. Less than eleven minutes long, the Sinfonia is typical of its composer: upbeat, tuneful, and perfectly proportioned. The other three works, while also diatonic, sit firmly in the most recent century. Ferenc Farkas (1905-2000) spent much of his young adulthood traveling throughout Europe before returning to his native Hungary in 1936. 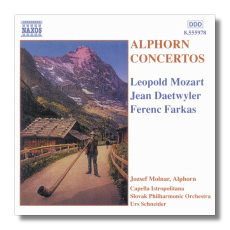 There are few large mountains in Hungary, and no Alps at all, so one wonders why Farkas thought of the alphorn in his three-movement Concertino Rustico. The work is flavored with paprika and other surprises; the lopsided rhythmic games in the Finale are delightful, for example. This music will stick in your ear. Jean Daetwyler's two contributions are hardly less intriguing. He was a Swiss composer, born in 1907, and also long-lived: he died in 1994. The Dialogue avec la nature takes a page from Vincent d'Indy's Symphony on a French Mountain Air, and it comes as no surprise to learn that Daetwyler was d'Indy's pupil at the Paris Conservatoire in the early 1930s. The birds twitter, the horn calls back, the mountain folk dance a droll measure, and all's right with the Alpine world. This is pure picture postcard music, and none the worse for that. The Concerto for Alphorn and Orchestra is somewhat more ambitious, but in a similar vein. It ends with a Totentanz (Dance of Death) because "men who live close to the land know by instinct that life can only come from death." Molnar was the première performer of Daetwyler's Concerto. A hornist by training, he nevertheless has specialized in the alphorn, and in expanding its repertoire and exposure. He accomplishes miracles on this CD, producing a sound of rough-hewn beauty. Schneider and his orchestras are polished and clearly enjoying themselves. You will too. Good engineering, 1987 vintage.